“Soul of America” concert. For those of us who were fortunate to even get a ticket to the sold-out performances, were treated to a nostalgic tribute to Otis Redding, Sam Cooke, Ray Charles and many of the other popular Soul and R&B performers. What is equally impressive is this boy-wonder has taken his talent, successes and opportunities in life and made a decision to give back to the young people in the community. He started and co-founded “ACT”, The Arts Conservatory for Teens. This non-profit organization has given kids the opportunity to express themselves freely and are encouraged to be creative and develop a sense of self-worth. By partnering with other organizations in the communities, he is providing the funding for seminars and workshops to educate, empower and enrich so many lives. His ultimate and hopefully attainable goal is to have similar programs in each major city and abroad. Sarasota was just the beginning of his new tour to entertain and bring even more awareness to his worthy cause…but to our good fortune, Alex Harris is committed to return next year to entertain us once again . I for one will be in the front row. June is African-American Music Appreciation Month. 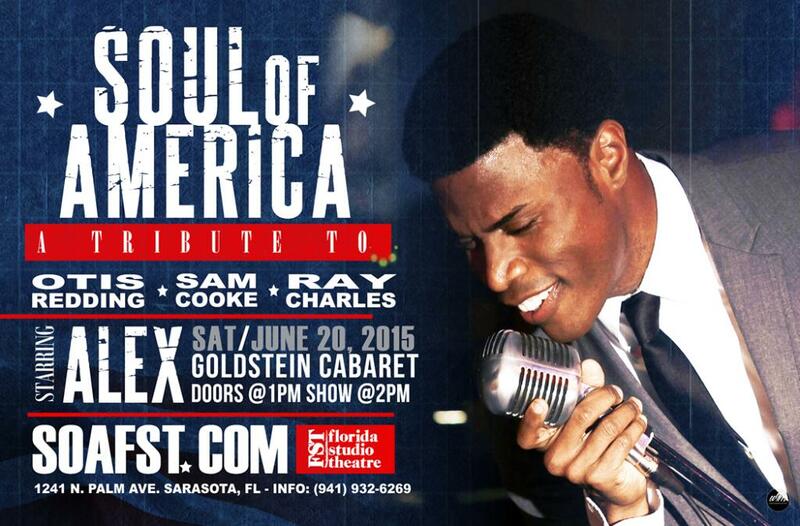 In honor of the great music many African-American artists have released over time, Florida Grammy showcase winner, ALEX presents, Soul of America a tribute to some of the greatest of soul music. Where: FST (Florida Studio Theater) 1241 Palm Ave., Sarasota, Fla.
ALEX a Soul/R&B vocalist and actor is no stranger to the entertainment scene. Having started his entertainment career at the tender age of 7 years old, he toured throughout the southeast region with his siblings. ALEX has a growing following world-wide because of his #1 hit singles, Hope for Us and Love Line, Top 20 Billboard success, Don’t Walk Away, with his brothers, A7, and his electrifying soulful and engaging performances. His polished lyrical styling and dynamic energy is a breath of fresh air with a very earthy twist that transcends multiple audiences everywhere he performs, including 2 of the Presidential Inaugural Galas, Premier of Bermuda Gala, Premier of Ireland Gala and many other prestigious galas, schools, colleges, corporate events, and festivals world-wide. ALEX has not only headlined his own shows, but has graced stages with entertainers and actors, such as Al Green, Bobby Rush, Eric Benet, John Legend, Kirk Franklin, Lamman Rucker, Leon and many others. In addition to Alex’s music career, he’s started his own music program for students, ACT: Arts Conservatory for Teens. By creating ACT Alex is giving kids between the ages of 11-18 the opportunity to express themselves freely and encourage them to be creative while refining their artistic skills in a professional environment.